Italian yacht tender builder Anvera has introduced its latest creation, the Anvera 48. The 14.5 metre boat is built entirely in carbon fibre, in keeping with its predecessor, the Anvera 55s. This lineup of Anvera all-carbon crossover yacht tenders are designed to be high-performance and environmentally friendly. According to the builder, this construction method results in an extremely light boat that boasts better efficiency, high speeds and reduced CO2 and pollution. The yacht tender's sleek lines are drawn by Aldo Drudi – who calls the yacht "a blend of beauty and speed" – and designed in 3D by Paolo Picchi, while hull design and engineering is by Andrea Frabetti. “I started designing the Anvera thinking about an elegant and very fast dolphin," says Drudi. "While the hull has been developed with hydrodynamic features in mind, the superstructure has been defined by aerodynamics." Anvera is part of LG-SRL, which specialises in composite materials. In an initiative led by Luca Ferrari, the company utilises the research of Team Italia Offshore, which was founded by Norberto Ferretti for the study and research of extreme technologies. Carbon also provides the opportunity to create interesting shapes in the exterior styling as well. The Anvera 48 stands out with her wing-shaped uprights around the deckhouse and the cockpit. Air venting is integrated into a single lightweight pillar supporting the superstructure. The Anvera 48 is comfortable and functional, with a 19 square metre aft beach area, 3.5 square metres dedicated to sunbathing and a spacious master cabin found below decks. 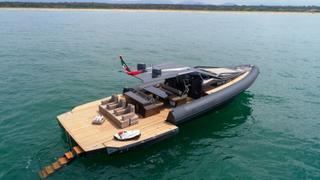 The superyacht tender is completely customisable with myriad finishing options, and it is priced from €690,000 as standard.